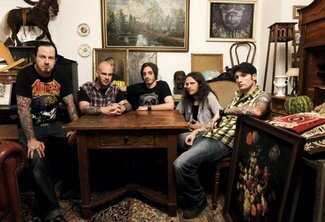 Formed in 1997, as Never Again, Caliban signed to Lifeforce Records following the recording a two-song demo tape. The new moniker was inspired by the Shakespearean character. The band from the west of Germany released a self-titled EP in the summer of 1998. Shows with Morning Again, Earth Crisis and Cro-Mags followed and the Germans recorded a full-length album called A Small Boy And A Grey Heaven. The year after the band and Heaven Shall Burn released a split-EP. Vent appeared in the spring of 2001 and was licenced by Imperium Records for Japan. As a result, the gang plated at the Beast-Feast 2001 in Yokohama. A tour of the USA with Bloodjinn followed. Jojo, the singer for Destiny, was drafted to help the band for several shows as Andy had to return to his day job. In August of 2002 Caliban entered the Woodhouse studio in Germany in order to record its third record Shadow Hearts. It was released in the winter of 2003. The band began touring the USA with Remembering Never, Scarlet and Dead To Fall in the summer of 2003. Caliban entered The Room studio in Gothenburg to record its fourth album, The Opposite From Within, which was produced by In Flames' singer Anders Friden and mixed and mastered by Andy Sneap. The album was issued by Roadrunner and licensed by Abacus and Century Media. The band and Heaven Shall Burn again issued a split-CD on Lifeforce Records in mid-2005. The group toured the USA in May, 2006 in support of its new release The Undying Darkness alongside Ion Dissonance and Sworn Enemy. The Awakening was issued in the autumn of 2007. The US release was handled through Century Media. Caliban, Heaven Shall Burn and Sonic Syndicate announced a Darkness Over X-Mas Tour for Christmas of 2007. The band signed a worldwide deal with Century Media Records in the middle of 2009. The group's seventh album, Say Hello To Tragedy, was due for release on August 24th. Caliban would issue Ghost Empire through Century Media in January, 2014. The album was produced by guitarist Marc Görtz. German-based Caliban released a new album, called Gravity, on March 25th through Century Media. It was produced by Benny Richter and guitarist Marc Görtz. Caliban’s Elements was released through Century Media in April.